This long-tested recipe is easy and inexpensive, yet creates a durable, beautiful paint for projects large and small. It is generally considered an interior paint unless properly coated with a suitable exterior topcoat. The amounts given will make approximately 1¾ quarts of paint, to cover approximately 90 to 100 square feet. To make less paint, simply divide the recipe in half or fourths. *If using lime putty for this recipe rather than lime powder, use twice the weight of putty and adjust any added water to create the proper consistency. Surfaces that will accept Milk Paint must be absorbent and free of previous finishes. They include wood, plaster, terra cotta, clay, etc. Milk Paint will not adhere to latex or other paints. Tests on questionable surfaces should be performed to confirm adhesion. Milk Paint is a translucent coating and should not be considered as a substitute for more opaque wall coatings. 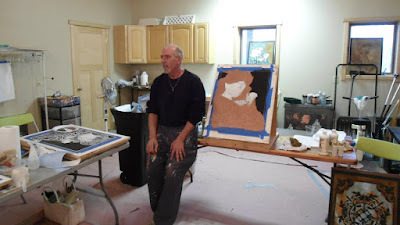 It is excellent for wash techniques on bare plaster walls. NOTE: Since quantities for dry ingredients are given by weight for accuracy, it is recommended to have a small gram scale for weighing dry ingredients. For this recipe we are using fresh milk that will be turned to curds with the addition of vinegar (or lemon juice). By curdling to create Quark, the milk protein is concentrated within the curds making a stronger paint. In addition it will not be prone to mold as milk paints created from fresh milk can be. Watch a video on making Quark. Allow the milk to stand and warm to room temperature, (in any case the milk should not be allowed to warm higher than 115 degrees to protect the integrity of the casein). With the milk in a large container, stir in two cups of white vinegar. Curdling will begin immediately. Allow the mixture to sit in a warm place overnight or up to two days. Do not stir again after you have incorporated the vinegar. It is important that the quark not be disturbed so that the curds can form together. You will notice that the milk solids separate from the liquid, creating solid curds and liquid whey. The first coat of milk paint will appear thin. If your base is too absorbent, the first coat can be diluted 20 to 50% with water as a priming coat. Many pigmented milk paint recipes add fillers such as Whiting Chalk or clay. We discourage the use of Whiting Chalk in Milk Paint because it has no binding power and promotes separation. However clay such as a neutral colored Kaolin Clay can be a good extender for Milk Paint. 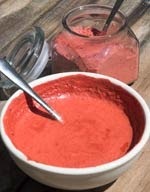 Keep in mind that the color will be affected, as less pigment can be used in the recipe. Clay will also lighten the color of any pigment used. Linseed Oil can be used as an additive to milk paint. To use, emulsify 1/4 cup of linseed oil into the quark after the lime has been added and allowed to set in the quark, and before the final addition of water. 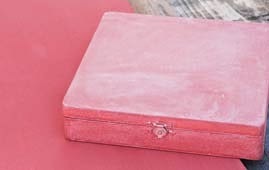 Our Acrylic Binder can also be added to milk paint to increase adhesion on questionable surfaces. Add at the recommended ratio to your prepared paint. Here we have the finished paintafter three coats on wood. Our Rosewood Mineral pigment appears brilliantly in the translucent milk paint base. On the bottom is the milk paint without any topcoat. The box on top has been given a topcoat of our Stone Tone Sealer with the addition of Super Sparkle Mica to give it a subtle sheen. One of the advantages of milk paint over latex paint is its versatility in finish coats. Once dry, milk paint can be protected with virtually any topcoat whether natural or acrylic/urethane. A protective finish coat is recommended and will enhance the color. Roman Beeswax Polish is an excellent wax for use over Milk Paint or varnish and shellac finish coats.